Everyone’s heard the expression “fighting like cats and dogs” - but with a little bit of work this doesn’t have to be the reality for your pets. 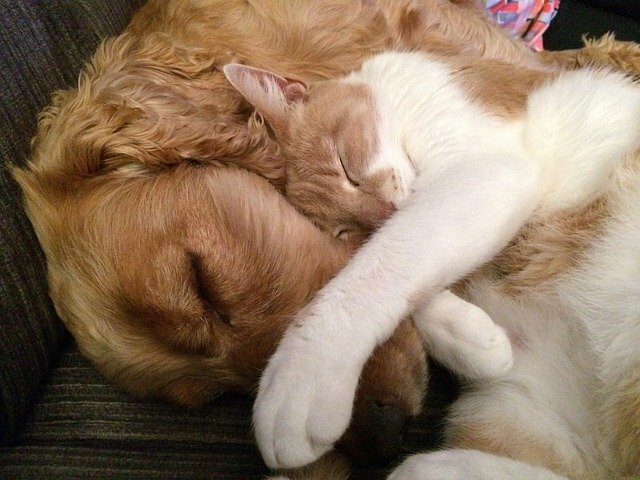 To help you out, we’ve put together a list of seven things you can do to ensure your pets have a happy life together. One of the best ways to get cats and dogs to coexist is simply to raise them together. Puppies are more easily trained than dogs and tend to be less confident, so they are more likely to allow their feline companions to assume the alpha position in the household. Of course, this isn’t always possible so if you need to deal with introducing grown cats and dogs, read on. It’s important that your cat has a space in your house that is all theirs. Having this space will be especially important when introducing your pets to one another for the first time, but will also continue to act as a refuge they can use when they need to escape and enjoy some downtime. If you live in a small space, don't worry about limiting the space your dog has access to. Since cats are natural climbers, you can make use of any vertical space in your house, whether it be a cat tree or newly installed shelving. Both of these are perfect spots for your cat to be able to observe your dog from a comfortable distance. Before you start with the face-to-face introduction, it’s a good idea to first introduce the other’s pets toys and bedding. By doing this, each pet will have the opportunity to get to know the other and satisfy their curiosity and potential fights that could break out if they investigated while the other was around. Animals use scent to familiarize themselves to new things so by doing this, each pet will be able satisfy their curiosity and you can avoid potential fights that could break out if they investigated while the other was around. When the time comes for your cat and dog to meet in person, it’s important to take it slow. Just like with humans, first impressions are important. And for a successful first impression food can be a great tool to ensure everything goes smoothly. The best time for your pets to meet is at mealtime. For the first-time meals, feed your pets on either side of a closed door. This way they won’t be able to see each other, but can still smell each other and start to build these positive associations between tasty food and their new friend. Continue this for as long as you feel necessary – a couple days to a couple weeks, depending on how your pets react – and then slowly introducing a visual element to the introduction. An easy way to do this is to feed your pets in the same room, but keep your dog on a leash. Eventually you’ll be able to remove all barriers between the two and they should be able to cohabitate nicely. Jealousy and resentment over toys, treats, and attention can have a huge impact on the relationship between a cat and dog, so it’s important to keep things equal. This means making sure your pets have access to the same amount of both toys and treats, so things stay fair. But this equality goes beyond just physical items – the time you spend with them should also be equal. For example, if you constantly make a fuss over your dog whenever you arrive home, your cat will quickly pick up and may start finding ways to display their displeasure at the inequality – or vice versa. 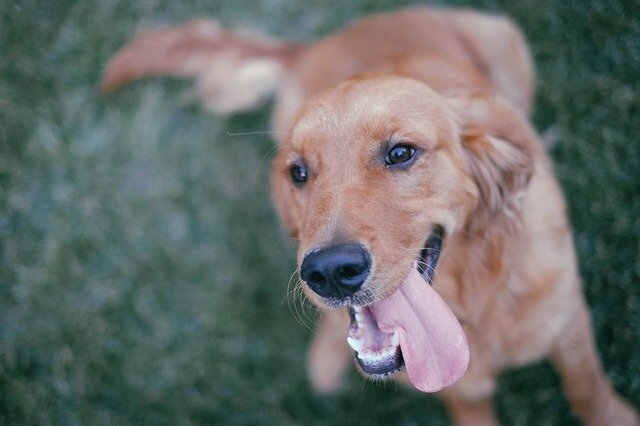 Before any introductions begin, it’s important that your dog has a strong understanding of their basic commands like sit, stay, down, drop it, and leave it. The better they know these commands, the easier the introductions will be as they will be able to remain calm while meeting the cat. 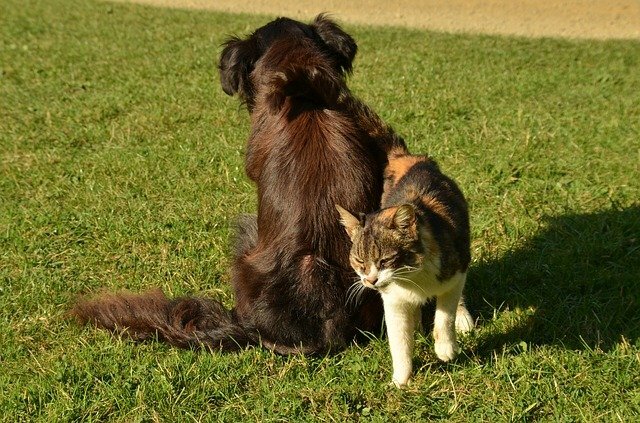 Whenever your dog is interacting with your cat, be sure to redirect any negative behaviors your pup displays, including rough play and barking. Instead of scolding them, try distracting them with another activity or command and allow them to “reset” before going back to your cat. 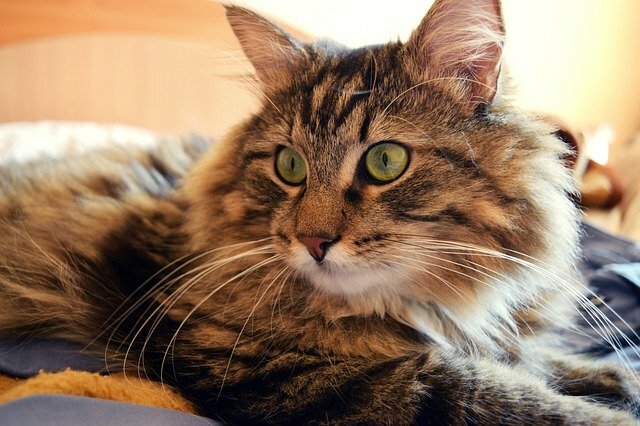 The more positive you can keep the situation, the more positive associations they will have with not just your cat, but any cat they come across. No matter how well they get along after the initial introduction, it’s a good idea to give them both some space that is just theirs. For your cat, this means having a private space for their litter box. Unfortunately, some dogs seem to be a little bit too interested about what goes on in litter boxes. If your dog tries to approach your cat while it’s using the litter box, it may cause your cat to feel threatened, and if it happens consistently can result in them avoiding the litter box to do their business. The same goes for food. Feeding your pets in separate areas minimizes the chance of an issue due to food aggression. It also ensures that each pet can eat at his or her own pace without feeling rushed. 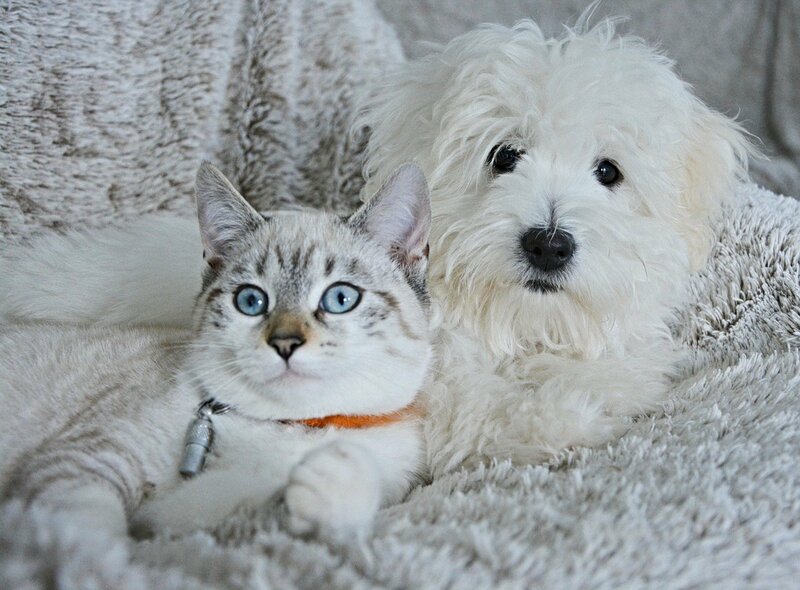 The most important thing to remember when introducing your pets is that all cats and dogs are different – what works for one may not work for another. If you’re struggling to help your pets develop a relationship, the best person you can talk to is your vet. They’ll be able to provide you with tailored advice or even put you in touch with a behavioral specialist. But in most cases, with a little patience, your cat and dog will be cohabitating happily in no time!